This entry was posted in Church of the Epiphany (Philadelphia), Church of the Holy Trinity (Rittenhouse Square), St. Clement's Church, St. Mark's Church (Philadelphia) and tagged Archives of the Diocese of Pennsylvania, Center City, Rittenhouse Square, Thomas Tidball on March 2, 2017 by mjk38. This entry was posted in Church of St. Luke & The Epiphany, Epiphany Chapel and tagged Center City, Logan Square, Oscar S. Michael, Ozi W. Whittaker, Philadelphia Times, Thomas Tidball on February 23, 2016 by mjk38. This entry was posted in Church of St. Luke & The Epiphany and tagged Center City, David M. Steele, Philadelphia Inquirer, Thomas Tidball, William Bower, William P. Lewis on November 14, 2015 by mjk38. This entry was posted in Church of St. Luke & The Epiphany, Church of the Epiphany (Philadelphia), St. Luke's Church (Philadelphia) and tagged Center City, Leverett Bradley, Philadelphia Times, Thomas Tidball, William Bower on October 25, 2015 by mjk38. 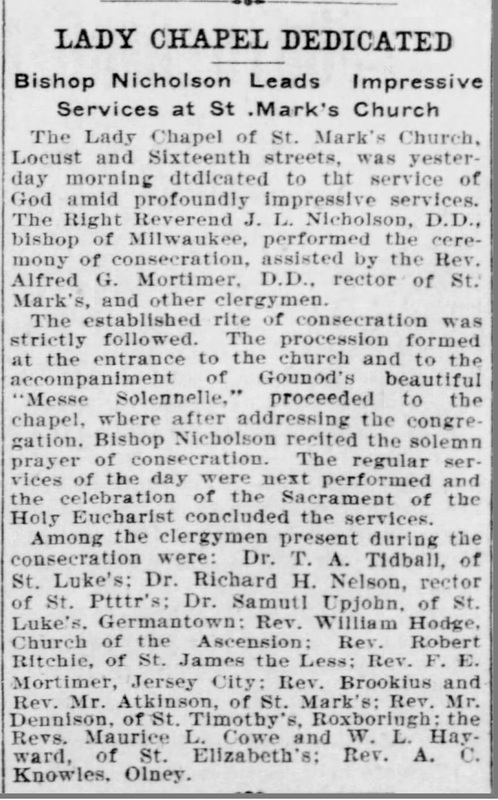 This entry was posted in St. Mark's Church (Philadelphia) and tagged Alfred G. Mortimer, Anglo-Catholic Parishes, Archibald Campbell Knowles, Center City, G. Woosley Hodge, George H. Dennison, Isaac L. Nicholson, Maurice L. Cowl, Philadelphia Inquirer, RIchard H. Nelson, Rittenhouse Square, Robert Ritchie, Samuel Upjohn, Thomas Tidball, William Leete Hayward on September 15, 2015 by mjk38. This entry was posted in Church of St. Luke & The Epiphany, Epiphany Chapel and tagged Center City, Leverett Bradley, Logan Square, Thomas Tidball on March 25, 2015 by mjk38. This entry was posted in Church of St. Luke & The Epiphany, St. Luke's Church (Philadelphia) and tagged Center City, Charles George Currie, David M. Steele, Gayborhood, Leverett Bradley, Thomas Tidball, William Bower on January 2, 2015 by mjk38. This entry was posted in Church of St. Luke & The Epiphany and tagged Gayborhood, Leverett Bradley, Parish Helper (St. Luke and The Epiphany), Thomas Tidball, Washington Square West on November 16, 2014 by mjk38. This entry was posted in Church of St. Luke & The Epiphany and tagged Gayborhood, Leverett Bradley, Thomas Tidball, Washington Square West on July 4, 2014 by mjk38. Let’s face it “The Church of Saint Luke and The Epiphany” does not exactly roll of the tongue. Many of its congregants simply refer to the parish as “St. Luke’s,” as a form of short hand. For close to 50 years, from 1839 to 1898, the present edifice on South 13th Street, was simply that – “St. Luke’s Church.” In 1898, by a momentous merger, St. Luke’s Church and Church of the Epiphany combined to form the present parish. Yet “and The Epiphany,” the oft-omitted part of the name, is key to the present existence of the parish. Before any discussion about the merger, it is important to discuss, briefly, 19th Century church financing and funding. Pews were owned. For example, pew 81, was purchased in 1841 for $750.00 (over $15,000 adjusted for inflation today). After a pew was purchased the pew holder was changed an annual 6% “ground rent.” Ground rents were used to pay for basic day-to-day operations like the rector’s salary or utility bills. Pew holders were expected to furnish their own pews with bibles, prayer books, hymns, and kneelers. The rector raised funds for projects beyond basic operating costs through private appeal to the more engaged or devoted pew holders. Those who could not afford to own a pew were welcomed to sit in the gallery. The “gallery congregation,” as it was called, was not expected to contribute very much to the financial upkeep of the parish. Annual appeals for missions and other charities were the only areas were both pew holders and gallery sitters contributed in equally numbers (though not in equal sums). This system would remain in place until the 1898 merger. In early 1888, the Rev. Leverett Bradley, of Andover, Massachusetts, was installed as the fourth rector of St. Luke’s Church. Already many of the large houses around the church had been transitioned into apartments and rooming houses for immigrants and industrial workers. The founding generation of the Parish was growing old or had passed on. The middle aged or older pew holders tended to remain in Center City, albeit many now lived west of Broad Street around or near Rittenhouse Square. Those middle aged or younger tended to followed the expansion of the railroads, relocating further still to the Main Line or Chestnut Hill (for at least part of the year). It was this suburban movement that concerned Rev. Bradley the most. He knew that there would come a time when the parish would not be able to solely rely on the wealthy to meet its operating costs. Securing the financial security of the parish, through a sizable endowment, became his focus for the remainder of his rectorship. Across Broad Street, the Church of the Epiphany, on the northwest corner of 15th and Chestnut Streets, found itself being encroached by commercial development. The construction of City Hall and the Pennsylvania Railroad’s Broad Street Station, both located at Broad and Market Streets reoriented the City’s business district west. As the blocks around Church of the Epiphany converted from stately residential townhouses to mid-rise commercial buildings, Epiphany’s congregation dwindled while the value of its property and edifice rapidly grew. 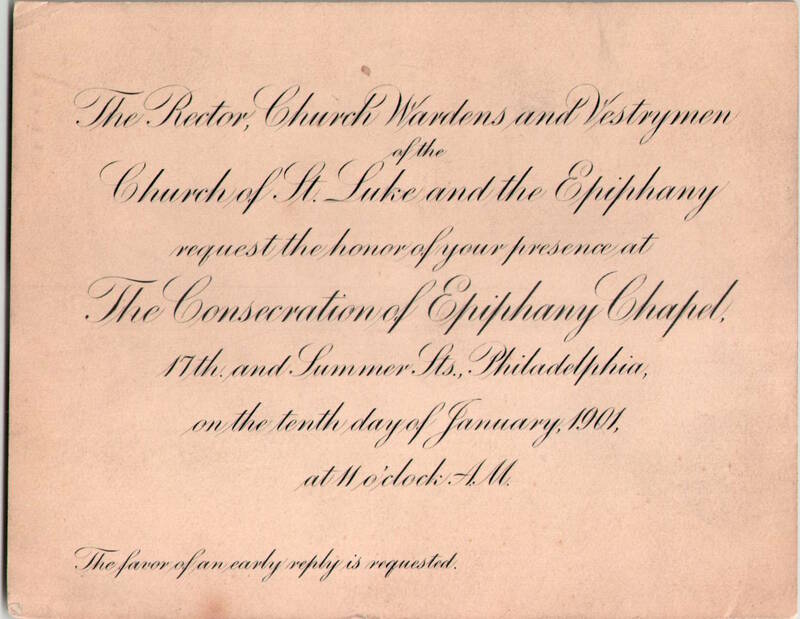 In 1896, fabled Philadelphia merchant John Wanamaker approached Epiphany’s vestry with an offer to purchase the property. After some negations, Wanamaker purchased the property for $600,000. Now homeless, Epiphany’s held services temporarily in the basement of ­­­­­the Baptist Tabernacle Church, at 18th and Chestnut Streets. Epiphany intended to build a new edifice further west in Center City. The congregations St. Marks, St. James, and Church of the Holy Trinity, who feared further competition for congregants, stymied this plan. An attempt was made to purchase the Christ Church Chapel at 19th and Pine Streets to no avail. Dejected, Epiphany’s rector, Rev. Thomas Tidball expressed interest in merging or consolidating to Bishop Ozi W. Whittaker. Leverett Bradley found the task of building an endowment herculean. Early efforts were made from within the congregation, with limited success. Preliminary discussions had taken place between St. Luke’s vestry and various Center City congregations about possible mergers. However, these discussions did not progress very far, and no action was taken. It was only after a bout with typhoid fever in 1897, which left Bradley severely weakened, did he entertain seriously any ideas of a merger. That fall, Rev. Bradley articulated his willingness to merge or consolidate to Bishop Whittaker. Bishop Whittaker indicated that Church of The Epiphany would merge provided that “Epiphany” appear in the name of the new parish and their rector assume the leadership position. Rev. Bradley felt the terms were agreeable. He suggested that Church of The Epiphany’s vestry should contact St. Luke’s vestry about a merger. St. Luke’s vestry would not act until they received assurances from Rev. Bradley that he was satisfied with an arrangement. Bradley’s consent to the merger would place him in the subordinate position of Associate Rector. Rev. Bradley assured the vestry the arrangement was satisfactory to him, for the merger with Church of The Epiphany fulfilled his goal of securing an endowment for the church. Church of The Epiphany brought with it $575,000, of which $300,000 would go immediately to the endowment. The merger agreement secured Rev. Bradley with a lifetime position, with the option of becoming senior rector if/when Rev. Tidball retired or resigned. Further, Rev. Bradley would be given a lifetime pension upon his retirement. Although Rev. Bradley gave up his pulpit for the future viability of his congregation, his vestry ensured his position would remain secure for the remainder of his tenure. After the ballots were counted, St. Luke’s pew holders voted overwhelmingly in favor of merger. After a similar vote at Epiphany, the merger became effective on April 6, 1898. The combined parish became the Church of St. Luke and The Epiphany. No sooner were the parishes united problems began to surface. Although the vestry and the rectors stressed the idea that the combined parish was a new creation (for example any discussion of St. Luke’s prior to the merger was referred to as Old St. Luke’s) many in the pews did not share that sentiment. The consolidated parish numbered about 700 congregants (an additional 200 or so attended Epiphany Chapel). Further the new congregation was overwhelmingly Old St. Luke’s. Of the 700 congregants, about 100 were former Epiphany congregants. Epiphany had the money, but it was St. Luke’s who had the people. It became clear that the majority of the new congregation remained committed to Rev. Bradley and treated him as their sole rector. As a remedy, the vestry recommended that Rev. Bradley take an 18 month leave of absence, preferably abroad. Bradley’s absence, it was hoped, would allow the congregation to become comfortable with Rev. Thomas Tidball’s leadership. By all accounts Bradley’s sojourn failed to meet the vestry’s expectations. Tensions between Rev. Tidball and the congregation continued. The real reasons behind Rev. Thomas Tidball’s clashes with the pew holding congregation have been lost to history. Some have suggested liturgical differences – however this is unlikely so since both congregations were on the lower end of the churchmanship spectrum. Others have suggested that had Rev. Bradley left the congregation altogether, Rev. Tidball would have had the latitude to become fully the rector of the combined parish. For whatever reasons, the problems continued until Rev. Tidball abruptly resigned on November 6, 1902 to be effective on January 1, 1903. He would head south, to Sewanee, and assume a position at the seminary there. The vestry gave Rev. Bradley 30 days to become either rector or rector emeritus. Given Rev. Bradley’s declining health the only reasonable action was retirement, and become rector emeritus with full salary as of January 1, 1903. Rev. Bradley would not live to become rector emeritus as he died on December 31, 1902 at the age of 56. The election of Rev. 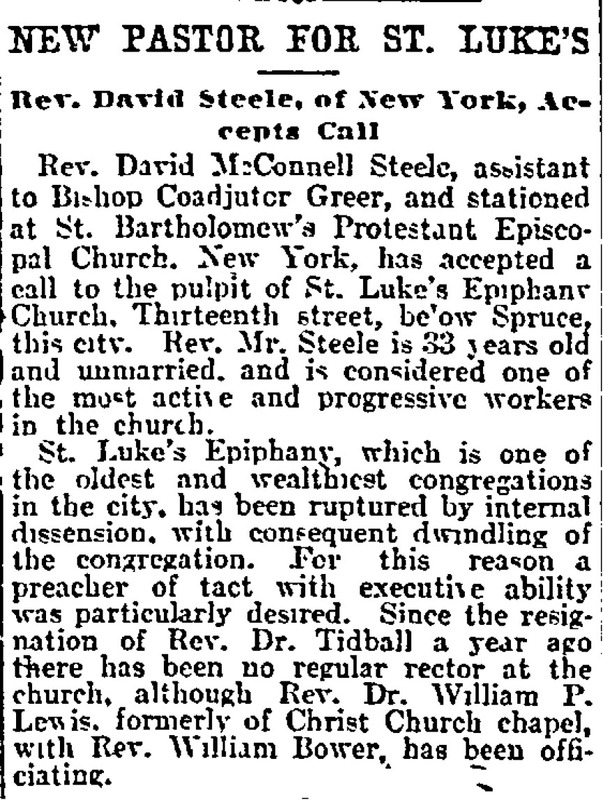 David McConnell Steele the following year as rector provided the neutral presence to bring Old St. Luke’s and Epiphany together to form The Church of St. Luke and The Epiphany. Early in 1904, the vestry organized a committee to develop a memorial to Rev. Leverett Bradley chaired by Philadelphia architect Frank Miles Day. Although Day did submit a design, the committee ultimately selected a memorial tablet designed by Philadelphia sculptor Charles Grafly. The tablet, which can be found in the nave, was dedicated on December 31, 1905. Rev. Tidball does not have any memorial. Instead his death was remembered with a two sentence announcement on the back page in the Parish Helper (St. Luke’s newsletter in those days). This entry was posted in Church of St. Luke & The Epiphany, Church of the Epiphany (Philadelphia), St. Luke's Church (Philadelphia) and tagged Gayborhood, John Wanamaker, Leverett Bradley, Ozi W. Whittaker, Rittenhouse Square, Thomas Tidball, Washington Square West on January 6, 2014 by mjk38.